Nikon’s D5000 strikes a great balance between price and features. It deviates from the nomenclature of its closest siblings, the Nikon D60 and Nikon D90, but no matter: It combines many of the best aspects of both while adding its own extras to the mix. This sub-$1000 model brings many of the features found in the D90 to people who want a smaller, lighter, and more affordable SLR camera. The D5000 isn’t as rugged as the D90, and it’s slightly larger and heavier than the D60. The camera has a pleasing balance to it, though, with logical button placement (similar to the D60, but with a few modifications). I especially liked the five-way directional pad and the Live View button located just above it. However, I missed having an easy-access button to set focus points (the D5000 has an 11-point autofocus system, same as the D90). And initially I was puzzled by the presence of two similarly labeled information buttons; I had to read the manual to tell them apart (one invokes the detailed on-screen settings and status display while the other changes the options within the status display). At least the manual is clearly presented and written. Like the D60, the D5000 lacks an integrated autofocus motor; that means you can use only AF-S mount lenses. The D5000 kit comes with an 18mm-to-55mm f3.5-5.6G VR lens. Its battery is rated for about 500 shots, and that’s about what I achieved in real-world use. The D5000 has a 2.7-inch tilt-and-swivel LCD. In our lab tests for image quality, the D5000’s photos looked a bit dark and muddied at automatic settings, but improved at manual settings. In my casual shooting outdoors, the manual settings were more consistent, but the Program mode setting often overexposed my images. For example, a daytime scene shot under Program mode appeared too bright at the camera’s autoselected 1/125 of a second at f5.6 exposure; but that same scene looked far more balanced when shot under Shutter Priority mode and using the camera’s internal metering to gauge the appropriate exposure (which ended up at 1/250 of a second, at f5.6). Live View worked well, but only after I set it to single-point focus. At the default focus setting, the camera caught a blurry image more often than not. 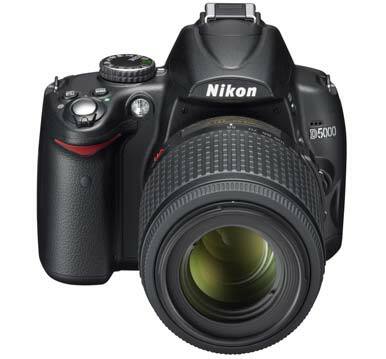 The 12.3-megapixel D5000 uses an APS-C (DX)-size sensor, same as the D60 and the D90. It has 19 automatic-exposure scene modes, and a maximum burst mode of 4 frames per second, half a frame shy of the D90’s maximum. Like the D90, the D5000 can take limited-length (5 minutes or 2GB) Motion JPEG video at 24 fps and up to 720p resolution, but it can’t autofocus while shooting video. Overall, the Nikon D5000 is well positioned to stand up to competing entry-level SLRs and crossover cameras such as those from Olympus and Panasonic based on the Micro Four Thirds system. Its price should appeal to SLR novices, and it offers a large enough boost in features over the Nikon D40x and D60 to entice users of those models who wish to improve on what they own now but still want to have a compact digital SLR. Just be aware that to maximize your results, you’ll have to learn your way around this camera’s settings.